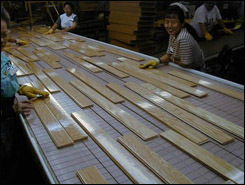 Americarpet: How is Hardwood Made? Knowing how home floor covering products are made is the sign of a savvy shopper. So well done, you’ve come to the right place to learn about the ins and outs of hardwood construction. So please read on, and we’ll do our best to help you understand how hardwood is made, the various types of construction, and the advantages and disadvantages of each for you and your home. To begin, remember the classic and the common. And the three common types of wood floors are Solid, Engineered and Longstrip Plank, each of which we will now address. Type 1: the solid yet sensitive type. Solid wood floors are one solid piece of wood that have tongue and groove sides. When we talk about solid wood floors, we tend to think of floors that are unfinished, but it’s important to know that there are also many pre-finished 3/4" solid wood floors. And you should also be aware of the moisture factor. Solid wood floors are sensitive to moisture and because so they are used in nail down installations and are not recommended for installation below ground level, or directly over a concrete slab. Because they’re a natural product, hardwood flooring will expand and contract in response to seasonal changes in moisture. In the winter heating months, moisture leaves the wood causing the floor to contract, which creates unsightly gaps between each plank. In the summer months, when the humidity is higher, the wood will expand and the gaps will disappear. If there is too much moisture it may cause the wood planks to cup, or buckle. Not something you want in your home. This is why it is important when installing a solid strip floor to leave the proper expansion area around the perimeter and to acclimate the wood prior to installation. This will help assure a lasting, beautiful application. Consider oak, for its qualities. The clear has no visual blemishes or knots and is extremely expensive. While the select and better quality has some small knots and very little dark graining. So be aware that when buying an unfinished solid oak floor and make sure you know which quality of wood you are buying. Type 2: engineered to perform. These wood plies are stacked on top of each other but in the opposite directions. This is called cross-ply construction which creates a wood floor that is dimensionally stable and less affected by moisture than a 3/4" solid wood floor. The advantage of cross-ply construction allows the plies to counteract each other which will stop the plank from growing or shrinking with the changes in humidity. The other advantage for you is versatility. You can install these floors over concrete slabs in your basement as well as anywhere else in you home. Engineered floors will range from 1/4" to 9/16" in thickness, and vary from 2 1/4" to 7" in width. The widths can also be mixed, such as 3-5-7-inch planks installed side by side. By varying the board widths you can change the total appearance of the floor. Create a truly custom look for your home. The lengths will be random and range from 12" – 60" in length. For versatility, engineered is tops. Because engineered wood floors are made up of several layers of wood the top finish layer can be a totally different wood species. A variety of domestic or exotic hardwood species are available such as Oak, Maple, Hickory or Cherry. You’re free to pick the one that suits your style! Type 3: the long and short of longstrip. The center core is generally a softer wood material and is used to make the tongue and groove. A hardwood finish layer is glued on top of the core. The top layer can be almost any hardwood species and is made up of many smaller individual pieces that are laid in three rows. Longstrip planks are approximately 86" in length and 7 1/2" in width. They generally have between 17 and 35 pieces that make up the top layer of each board. This gives the effect of installing a board that is 3 rows wide and several planks long. Each longstrip plank looks like an entire section that has already been pre-assembled for you. This alone can create a unique look all your own. Longstrip planks are designed for the floating installation, but most can also be glued-down, or stapled down. Because these floors can be floated they are extremely versatile – they can go over a wide variety of subfloors and on any grade level. 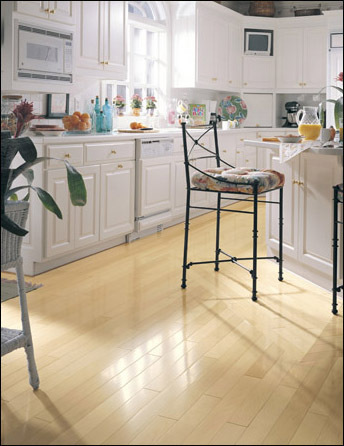 Like engineered floors, longstrip floors come in a wide variety of domestic and exotic hardwood species. Find the one you love and go for it. Longstrip plank floors have another advantage. When damaged, they are easy to replace. Good news for active families!